February | 2014 | This is Ashok. Earlier today Matt Yglesias borrowed a chart from Thomas Piketty’s new book noting that public assets remain above public debt. This chart actually underestimates the strength of our balance sheet. A more striking image is the ratio of our gross national product (GNP) to our gross domestic product (GDP). It’s worthwhile asking yourself what exactly national debt represents – a claim on future income. This graph suggests that our claim on everybody else’s future income is way higher than their claim on our income. You should be scratching your head – why are emerging markets throwing money at us when the domestic return on capital is far more attractive? They are lending us really cheap credit so that we can recycle that to our firms which then invest in foreign equities earning a huge premium. That should sound pretty familiar to you, because it’s basically how Wall Street made all of its money. America, basically, is a huge hedge fund. But for the Federal Government, this isn’t a problem. We can always roll over our debt since the dollar is sovereign. We can actually make some pretty insightful observations taking the perspective that the government is a big bank. We could theoretically sell our foreign assets to repurchase our own debt (or, since we don’t have a sovereign wealth fund, tax our citizens more, which is the same thing) which is less volatile than emerging market equities (and isn’t subject to any currency risk). But we’d then be short emerging market, which means we would pay the risk premium rather than earn it. The in-built short term volatility isn’t actually a big deal, either. In the long-run, equity indices are pretty well correlated with economic growth, and everybody else will grow faster than us on average. That leaves liquidity risk, but because the Federal Reserve exists even that is negligible. The currency implications of this are even more mind bending still. For most countries, a depreciation has a negative wealth effect – that is we can buy less on the international market than before in real terms. But the more our own inflows are denominated in foreign currencies, the less obvious this link becomes. That gives monetary policy more space as higher inflation would be a lot less detrimental for us than any other country. People are happy to pay a premium for safety. We should be happy to earn that spread. One of the biggest skills I’ve gained writing an economics blog is dispassionate writing and thinking. Sure, we all have ideologies and spirit, but a common thread across good writing is relatively sterile analysis. For me, that means not writing about things that truly incite me (beyond an intellectual curiosity). Like the criminal justice system. Or elephants and their poachers. But as Ferris Jabr writes, “to look an elephant in the face is to gaze upon genius”. It is abundantly clear to me that the problem is largely economic, and therefore something that I should at least try to blog about without expletive passion (of which there is plenty elsewhere). I hope more economists publicly and privately advocate market solutions to the poaching problem – because the government, unsurprisingly, lacks the necessary competence in basic market design and incentive formation. Economics is a constructive field, and is therefore concerned with efficient means of building a market. The task at hand is efficiently destroying a market. That is very difficult. It’s not really possible argue whether a market is driven by supply or demand, but for reasons I’ll outline, it is fair to assume restricting demand should be the primary tactic. African governments unfortunately lack the competence, wherewithal, and and will to fight monied (probably Chinese) interests in any meaningful way. The investment necessary in good law enforcement to prevent large poaching networks is something that Africa will not have for a long time. And, anyway, that money is better spent on education and infrastructure. African countries shouldn’t have to drain the public purse because of foreign demand that dwarves its national wealth. More importantly, the production function will remain cheap so long as poachers need to kill elephants to put food on their children’s plate. And who can blame them? Poaching wouldn’t be a problem if elephants roamed American prairies as they do African forests. But Africa is no America, and any real effort should start with demand. A ban is the crucial first step, but easily circumvented (in the United States, for example, you can only purchase ivory that is at least a hundred years old – but how hard is it to forge the necessary documents), especially if the punishment isn’t commensurate with the potential reward. Enforcement is also ridiculously expensive. Police officers and the DEA waste billions trying to stop people from smoking crack, but the results are a complete joke. Sure we don’t have the brightest people spending that money (to say the least), but enforcement costs are non-trivial, especially without a culture that supports the cause (If everyone was a murderer, police officers couldn’t do a thing about it). Civilizing people is a long process. It took centuries for humans to see the moral flaws with slavery – a far more heinous crime – and the socioeconomic forces in emerging markets to flaunt wealth is strong; without a government that really cares it is unlikely we’ll get anywhere. So molding culture is out of the question (in the time period we have, which isn’t that long). In contemplating a solution, I couldn’t but think of George Akerloff’s “A Market for Lemons”, one of the best pieces of economic intuition and analysis I’ve had the pleasure of reading. Without getting into the details, the import of his paper is that a market can break down under a little information asymmetry. Policymakers and conservationists need to stop auctioning horns and burning stockpiles of ivory, they need to create this asymmetry. And it’s not hard. By virtue of being a black market, there isn’t a good organized body that can consistently verify the quality of ivory in general. Sure, it’s easy to access, but ultimately there’s a lot of supply chain uncertainty. There is a cheap way to exploit this. The government, or some general body that has access to tons of ivory, should douse (or credibly commit to dousing) the tusks with some sort of deadly poison, and sell the stuff across all markets. Granting some additional complexities, the black market could not differentiate between clean and lethal ivory, and buyers would refrain from buying all ivory in fear. The market would be paralyzed. It is analogous to Wall Street during a bank run, and probably stronger given that lives – and not just portfolios – are on the line. And it’s far cheaper than anything we’re trying to do now. (As a commenter notes, another smart method would be to flood the market with uncertainty of authenticity, but this is a lot harder to achieve, and possibly very expensive). It sounds like a batshit crazy idea, and it probably is, but it’s not morally that much worse than what we have now (that is even completely ignoring the cruelty of purchasing ivory in the first place). The human suffering of the current system is immense, with many poor Africans threatened or bullied into poaching under the threat of death. Moreover, many African governments – in a Hail Mary effort to combat the Chinese economy – have draconian penalties for those caught poaching. I would only transfer that risk from producer to consumer, suggesting the trade, ethically, is weakly superior at least. It is hard to imagine such a fragile market functioning with a competent organization trying to fool it. It wouldn’t even require governmental support (though may be illegal). If you’re a mess about the ethics of poisoning people, we can try the flu instead. This is, like unemployment, a moral, social, and political problem. And, like unemployment, it has an economic solution. I don’t know if what I’ve outlined could actually work in practice (though I am somewhat confident that a well-thought out try, with the proper support, would make a difference). But I do know that without aligning incentives and goals we have no hope. It’s time for better ideas than burning stockpiles or auctioning hunts. A number of people have commented on a new paper from Robert Gordon, professional pessimist. Many people have identified the specific issues with the logic in this essay. But I think it’s important to discuss a central problem with the very idea of Gordonesque gloom. First, distinguish between positive and negative pessimism. If NASA were to tell us, with great confidence, that an astroid will strike Earth tomorrow there is no case for disdain. This is a scientific judgement and, at least philosophically, would be akin to standing in front of a speeding train and claiming that it won’t hit you. That is not the sort of pessimism that concerns us. But Gordon is making a much more powerful claim, a pessimism about what won’t happen – that our entrepreneurs cannot create another industrial revolution, that we’ve pretty much done the most we can with robots, and artificial intelligence is limited to the grocery store. This requires a certain knowledge about the trend of technological progress and the economic value thereof. Gordon knows much more about the former than most and may well be the reigning expert on the latter. Unfortunately that doesn’t help us out. Because, believe it or not, most any of us can make this claim without any technical skill and little more than economic knowledge. If you knew that some form of AI was going to revolutionize the world, and that building it is tractable, there’s a good chance it already exists or will be built relatively soon. Because that’s all you need to know to make a profit from basically nothing (patent the idea and rent the rights out when someone who can build it builds it). But it’s very rare that we make something from nothing so most of us, like Gordon, don’t see anything great about the future. But that only means that me, you and Gordon don’t know what that invention will be, not that some arbitrary such invention won’t be. So Gordon is claiming that the space of all future invention is limited and the costs of finding the marginal source of technological growth are limited and, equivalently, that he knows the space of all future growth. That’s a rather strong claim. He rather strongly asserts that the last three stagnant decades are a better indication than the last century. 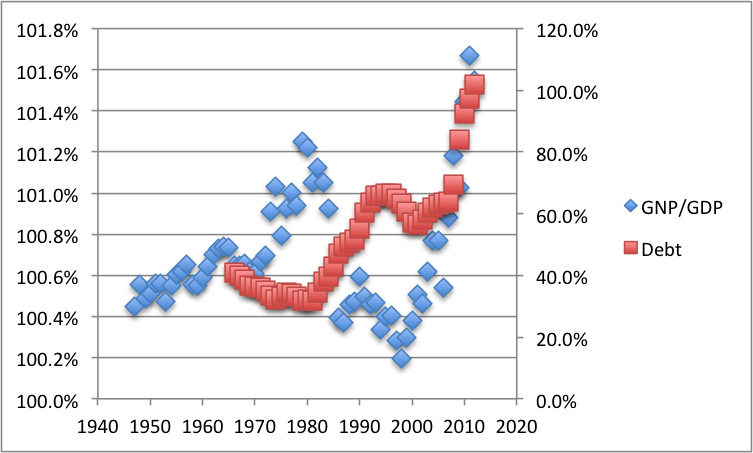 Choosing the postwar boom may be an outlier but, accordingly, so too would choosing a bad period like the past fifty years arbitrarily. By claiming that he understands growth will slow, Gordon implicitly declares that he understands the mechanics of future innovation. But that isn’t the case with optimism. As statisticians will tell you, proving a positive is possible. You an always say “something may exist that we can’t even comprehend” – how could you disprove that. It’s not objective, and you’re not going to make money off this belief but it just isn’t as philosophically flawed as a belief in perpetual stagnation. Most discussion about our economic future – on the scale Gordon speaks – has been horribly wrong (read a certain John Maynard Keynes’ Economic Possibilities for our Grandchildren) and claiming that there won’t be a new digital revolution tomorrow (or even in the next decade) is trivial. In fact, a central tenet of efficient markets is that you can’t keep beating the market and those who do are probably just lucky. (If we had growth denominated bonds Gordon could literally beat the market). The probably here is key. Maybe you’re a financial trader and play golf with a certain Janet Yellen. Or maybe you heard about Steve Jobs’ cancer before anybody else. But here there’s a clear source of the insider information. Unfortunately you and me can’t be insiders with God.